This upper-level textbook offers an original and up-to-date introduction to issues in corporate social responsibility (CSR) from a global perspective. Written by an international team of experts, it guides students through key themes in CSR including strategy, communication, regulation and governance. Balancing critiques of CSR with a discussion of the opportunities it creates, it includes chapters devoted to critical issues such as human rights, anti-corruption, labour rights and the environment. Pedagogical features include customised case studies, study questions, key term highlighting, practitioner pieces and suggestions for further resources. The book is also complemented by a companion website featuring adaptable lecture slides, teaching notes for cases and links to related resources. Tailored for upper-level undergraduate and postgraduate courses on corporate social responsibility, sustainability and business ethics, it is also relevant to non-business courses in political science, international relations and communications..
￼Finally, a text with the courage to stand up and tell CSR’s whole wonderful, conflicted story. As savvy about corporate practice as it is about academic theory, this text will set the bar for all that follow. CSR in its best form! This is a pedagogically valuable, comprehensive, critical, and thought provoking textbook on CSR written by the leading experts in the field. It will be a compulsory reading for any student and academic interested in the changing responsibilities of business in a globalized world. 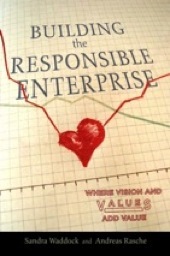 Building the Responsible Enterprise provides students and practitioners with a practical, yet academically rooted, introduction to the state-of-the-art in sustainability and corporate social responsibility.The book consists of four parts, highlighting different aspects of corporate responsibility. Part I discusses the context in which corporate responsibility occurs. Part II looks at three critical issues: the development of vision at the individual and organizational levels, the integration of values into the responsible enterprise, and the ways that these building blocks create added value for a firm. Part III highlights the actual management practices that enable enterprises to achieve excellence, focusing on the roles that stakeholder relationships play in improving performance. The book concludes with a conversation about responsible management in the global village, examining the emerging infrastructure in which enterprise finds itself today. Throughout the text, cases exemplify key concepts and highlight companies that are guiding us into tomorrow's business environment. This book is extremely readable without sacrificing attention to relevant studies. It does a wonderful job of translating research for those who do not spend their professional lives immersed in this topic. It is a very timely and comprehensible read, even given its attention to academic literature. The authors present research findings in a readable fashion, lacing the details of studies with current examples to make the mundane come to life . . . Recommended. This book is about a public-private partnership initiative of the United Nations: The United Nations Global Compact. The book reviews the first ten years of the Compact’s existence (2000-2010) by pulling together exclusively commissioned chapters from well-known scholars, practitioners, and Global Compact staff. All authors reflect on what the Global Compact has achieved, what trends it may have to respond to, and what challenges still lie ahead when considering the political environment that the initiative navigates in. For the first time, practitioners from the business world and civil society, well-known academics who have researched the Global Compact, and Global Compact staff join forces to systematically discuss the initiative. The books contains chapter contributions by Huguette Labelle, Oded Grajew, Paul Hohnen, Guido Palazzo and Andreas Scherer, Carolyn Woo, Malcolm McIntosh and Sandra Waddock, Dirk Ulrich Gilbert, Pat Werhane and Regina Wolfe, Guy Ryder, Greg Unruh and others. This book offers a comprehensive analysis of the initiative’s governance, its engagement mechanisms and, most importantly, its impact. I commend it to a wide global audience, and to all who want to learn more about the Compact’s journey and its proven capacity to generate positive change for people and the planet. 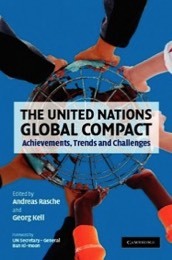 This timely book reviews the UN Global Compact's strengths and shortcomings over its first decade and provides helpful guidance for all committed to mainstreaming responsible business practices and achieving real change through multistakeholder intiatives. This book is all about questioning 'conventional' assumptions in strategy research. I argue that strategy scholars are very skilled in obscuring paradoxes and, by doing so, sustain their traditional assumptions. 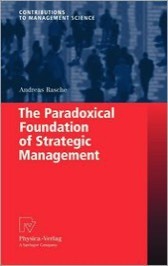 The text deconstructs the theory of strategic management by using the philosophy of Jacques Derrida. Only a deconstruction of strategic management uncovers the many paradoxes that are at the heart of theorizing about 'strategy'. Despite conventional wisdom, I claim that paradoxes are very helpful in getting to know the limits of knowledge about strategic management. Thus, I explain how paradoxes can stimulate future theorizing about strategic management and why we should value them more than we currently do. This book is a novel, refreshing and important contribution to the generally unreflective and programmatic approach widespread in strategy research. Andreas Rasche is right: We have to think of strategy as being always already in deconstruction.